The main street of the Jewish Quarter is a Roman street, where the shops were built by crusaders, the wall in the center is from the First Temple period, the houses are from the 19th century, and its synagogues from the 17th and 18th centuries. The tour in the Jewish Quarter will take you on a fun journey through different times, many conquerors, tales and legends, just 5 minutes away on foot from the Western Wall. Where else in the world would you be able to find a 2000 years old Jewish home inside a man's private basement? Or an archeological museum of priests who served at the Temple in a basement underneath a modern Yeshiva? 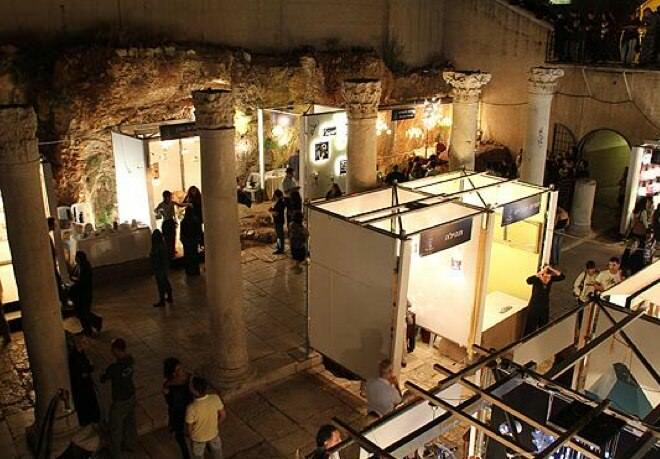 And what about modern shops in a 1000 years old authentic building? all of these are waiting for you at the Jewish Quarter of the Old City, a unique place with many rare and singular sites enclosed in a small area of 120 acres. Not to mention, almost everything is for free. The Jewish Quarter is the third largest quarter of all four quarters of the Old City, with 600 families living in it today. During the Independence War in 1948, the Quarter had fallen, with the rest of Old City, into the hands of the Jordanians, led by Abdullah el-Tell. Until its release, nineteen years later, all the buildings and houses of the quarter were used as horse stables and warehouses for the Jordanians. Since 1967, the quarter was completely restored, the construction works continuing until 1983. While renovating and restoring, the main goal was to preserve the past, which is why there are no visible power cords or telephone lines here, a clever blueprint managed to put everything underground.A small and interesting museum, dedicated to the events of 1948 is open for visitors at the heart of the quarter. You can start your tour of the Jewish Quarter in the central square next to the Cardo and the Hurva Synagogue, also the center of the quarter. The Hurva Synagogue was restored and rebuilt recently, and it deserves a visit (requires that you call ahead) on its own. From there turn into Ha'Yehudim street, and the Cardo Maximus, the main street of ancient Jerusalem, as seen here in all its glory, and which runs 22.5 meters wide, built over 1,500 years ago. At the covered part of the Cardo stands a duplicate of the Jerusalem part of Madaba map, its original print kept in Jordan. The large church, as seen in the center of the map, is the Holy Sepulchre, which used to reach the Cardo in the Byzantine period. On the left side (Northern) of the map you can see the area of the current Damascus Gate, and next to it a column used to measure distances from Jerusalem to other cities, such as Nablus and Damascus. On the top right part of the map (Southeast) is an empty part, and some researchers believe that that had been the location of the Temple Mount at that time – abandoned and neglected, just as Jesus predicted (the Byzantine period was the time of Christianity rule). 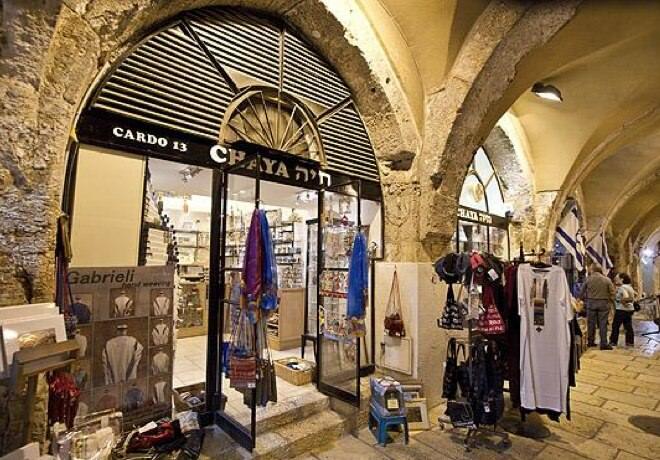 The souvenir and Judaica shops at the Cardo were built based on the original shops that were here during the Crusader period (In the 12nd century the Cardo was raised and narrowed). 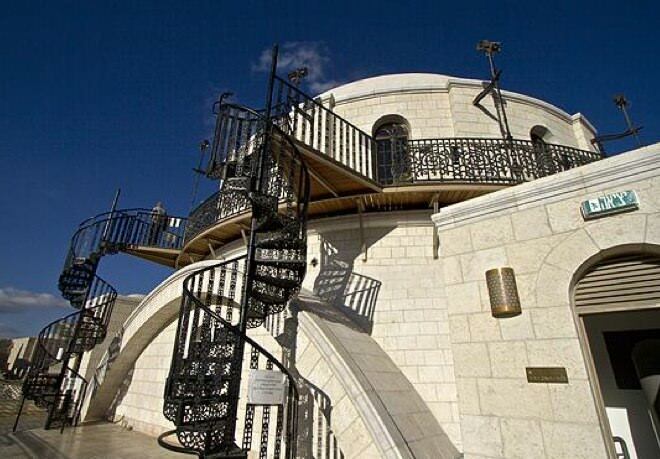 From here it is possible to go up to Chabad Street and then climb North to the iron stairs to see the panoramic view of Jerusalem from the rooftops. Another option is to climb up the stairs and go through HaYehudim treat to the broad wall (here you can also find clean public toilets). The broad wall on Plugat HaKotel street is one of the few remnants left in the Jewish Quarter from the era of the first Temple. The wall was created by King Hizkiyahu, who had to deal with the Assyrian threat on Jerusalem. The Assyrians are mentioned in the Bible, in 722 BC as the conquerers of the kingdom of Israel. When the siege arrived to Jerusalem, in 704 BC, King Hizkiyahu hid the waters of the City of David, coming from the Gihon stream, using the Shiloah Tunnel, also known as Tunnel of Hizkyahu, also adding fortifications, such as the remains of the wall that we see in front of us. The wall is 7 meters wide (hence the name – the Broad Wall) and 8 meters tall. The construction sketch of the wall can be seen on a drawing on a wall above the Wall. The place was also mentioned in Isaiah (22:10-11): “and you counted the houses of Jerusalem, and you broke down the houses to fortify the wall. 11 You made a reservoir between the two walls for the water of the old pool. But you did not look to him who did it, or see him who planned it long ago”. The old pool is the Shiloah Tunnel, and the destruction of the houses around it allowed building the wall fast, before the arrival Assyrian enemy. Looking at the northwestern part of the wall we can see that the wall is actually standing on the remains of walls from the destroyed houses. Near the Broad Wall, in the Shonei Ha-halachot Street, satnds the Israeli Tower, also a survivor from the first Temple period, a model of the Temple Mount and Jerusalem. This place is a must see site in every tour to the Jewish Quarter. From the starting point of the tour, the big square, we shall continue through Beit El Street to the Shelters Square. A few meters before the square you will find a monument built as a memorial to 48 soldiers from the Jewish Quarter who were killed in the Independence War. The bodies were buried here in 1948, and only after 1967 their bones were transferred to the mass grave on the Mount of Olives. Some of those soldiers were only 16, and the youngest of them, the youngest martyr of the IDF was Nisim Gini, only 9.5 years old. A shelter square was established due to the severe crowdedness inside the walls, the housing shortage and sanitation problems in the Jewish Quarter. The area was purchased in 1857, by wealthy Jews, who founded the company “almshouses on Mount Zion Tovba (Abbreviation for “Build and pay quickly in our days”)”. They offered mostly free housing, in high quality apartments of two rooms, a kitchen, and a paved courtyard, a cistern and more. The apartments were given to immigrants from Hungary and generally to poor people. 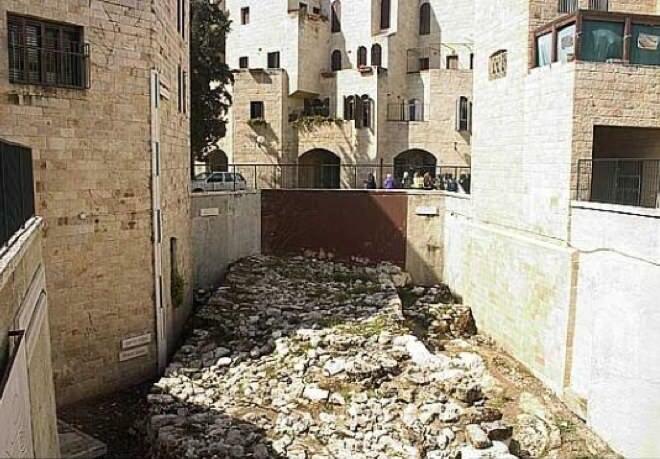 Later, more apartments were purchased in the Muslim Quarter, and when it wasn’t enough as well, Moshe Montefiore became active, managed to receive money from Yehudah Tora and built Mishkenot Sha'ananim. And the rest is history. The shelter square was one of the last places left in the hands of the defenders of the quarter in 1948, and here they held the Order under the Jordanian army, before being transferred to West Jerusalem or taken prisoner by the Jordanians. In the southern part of the square, near the school, it is possible to go down to the Nea Church apse (The “New” church), Byzantine church that is also presented in Madaba map. You should ask the guard where the key is. Next, walk on Gilad Street, turn left to Tiferet (glory) Street and you’ll come to the four Sephardic Synagogues in the Mishmarot ha-Kehuna Street. The entrance costs 5 NIS for a kid, and 7 NIS for an adult. 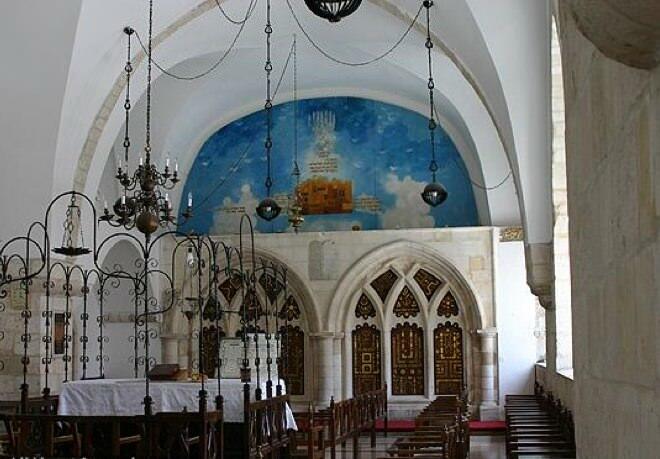 In the early 17th century, the descendants of those who were expelled from Spain built a synagogue dedicated to the memory of Rabbi Yochanan ben Zakkai. The synagogue has two Holy arks, as was the custom in the Ramban Synagogue. During the Independence War, the building was destroyed, and later restored. The trumpet and the oil above the top window on the southern wall replaced the ones that were destroyed. It was traditionally claimed that the destroyed tools were from the Temple itself. The structure of the Box in the center, and the sitting arrangement is typical to the Sephardic Synagogue. In the past, the Chief Sephardic Rabbi was chosen here, and today it is the praying house of the Sephardic local community. A connecting door will lead you to the Synagogue of Elijah the prophet, which probably served as a Yeshiva beforehand. According to tradition, the people sitting at the Midrash (at the Yehisva) building discovered on Yom Kippur’s eve that one person is missing for a quorum. Suddenly, an unknown old man appeared, and disappeared right after the day was over – maybe it was Elijah himself. “His” chair was moved to a small cave in the Northern corner of the hall, but it was robbed during the Independence War, and now a replica is there instead. A magnificent Holy Ark was brought from Italy after the 2nd World War as well. The third synagogue is “Kahal Zion”. Above the entrance stands an empty wall – a memorial to the destruction of the Temple. The third synagogue, the Istanbul Synagogue, was built in the 18th century by Turkish immigrants. It was also reconstructed in 1967, when a Holy Ark and a Box from Turkey were brought to it. The legend says that there was a tunnel from the Tomb of David in Zion to the Sephardic synagogues, yet despite various known versions of the legend – this tunnel was never found. The Jewish Quarter has many sites worth visiting, all located only a few minutes’ walk from each other: Zion Gate, the Silberberg House (for a fee and in advance appointment), the old Yeshuv yard (for a fee), The Ramban synagogue, the model of the first Temple (pre-paid and appointment), observation of the Western Wall, roof of the Yeshiva of the Temple (only by appointment. Recommended! ), the Herodian Quarter and the Burnt House (for a fee), the institute of Temple vessels, glory of Israel synagogue and the Karaite synagogue. Some of the sites are not open on Saturdays, so you might want to visit during the week.